I receive the message $300.00 the barrel and $75 the bushing. It is good that they supply a matching bushing. Now it will be interesting to see how it fits in the slide against the slide stop pin. Will be interesting to see how they are dimensionally? Clark’s 1911 barrels are all over the place! Will be interesting to see how these work out. Now I just need a model 52. Thanks kc for the news,better i will wait for KKM and EGW!!! Psst! Hey KC. M52 Marvel cuts. Know what I mean? Along with a pony for Christmas and whirled peas, I'd like a M52 sear spring that doesn't lose tension. Actually I am visualizing sending my M52 to KC's charm school. He cured everything that ailed my M41 except the grip nut. 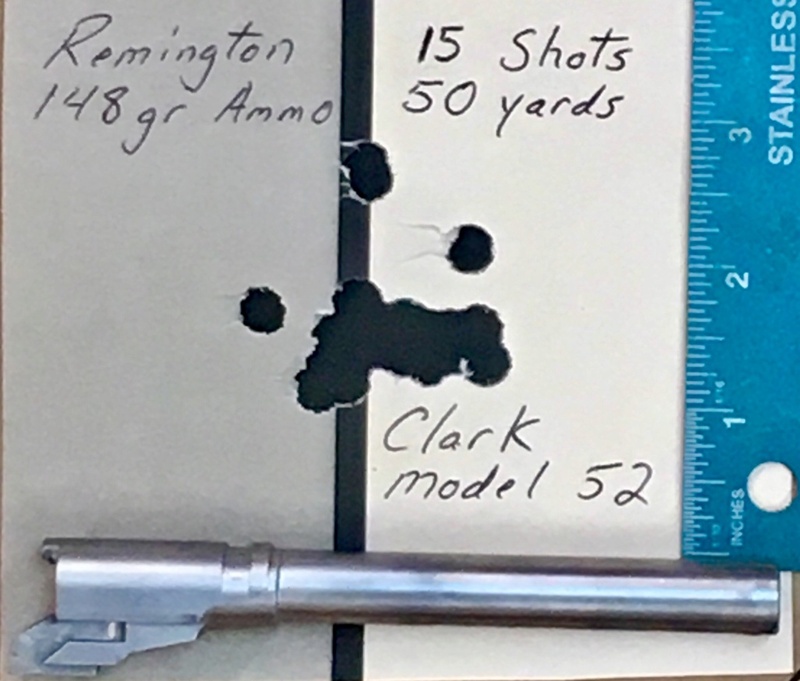 looking forward to hearing how these Clark barrels shoot at 50 yds compared to the S&W original barrels. Very nice group! Can you please share a bit more details on what the fitting process is? I assume those barrels are not drop-in.